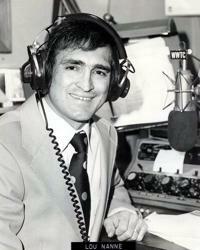 Louis Vincent "Lou" Nanne (born June 2, 1941 in Sault Ste. Marie, Ontario) is a retired ice hockey defenseman and general manager who has made significant contributions to hockey in the United States. Nanne's name has become synonymous with Minnesota hockey throughout the years. His nickname, "Sweet Lou from the Soo," stems from his native town in Sault Ste. Marie Ontario where he played his minor pro hockey with the Esposito brothers. His roots in Minnesota start back with his playing days with the Gophers after he moved to the University of Minnesota in 1960 where he studied business administration. With the Gophers, he became the only defenseman to this day to win the WCHA scoring title. He was one of the biggest stars in American college hockey during the 1960s, and became an American citizen in 1967 which allowed him to play for the US Olympic hockey team. As a captain of the US Olympic team, the squad finished 6th at the 1968 Winter Olympics in Grenoble. Nanne started his National Hockey League career with the Minnesota North Stars in 1967 after the Olympics. He would spend his entire career in Minnesota, playing 635 NHL regular season games for the Stars in 1968-78. A steady defenseman and sometime forward, he scored 21 goals in 1971-72 but was mostly known for his defensive, penalty killing abilities. Nanne frequently played for U.S. national team in 1976-77 as the lowly North Stars usually failed to make the Stanley Cup playoffs, allowing him to participate in the 1976 and 1977 Ice Hockey World Championship tournaments as well as the inaugural 1976 Canada Cup. Nanne served as the team captain or assisting captain in all of these tournaments (he also was captain of the 1968 Olympic team). "Playing in the Olympics is much different from playing professional hockey. There was an immense pride in being able to play for your country, transcending the game itself," recalls Nanne. Lou Nanne is probably best known for his career as a general manager and coach of the North Stars and for the United States Canada Cup entries. He quickly rebuilt the North Stars into a contender after his playing career ended in 1978. The Stars reached the Stanley Cup finals in 1981 and semifinals in 1984. Nanne also served as general manager of the United States team in the 1981 Canada Cup and 1984 Canada Cup tournaments. He finally resigned from the North Stars in 1988 due to health reasons. Lou stays involved in hockey as a supporter of Minnesota High School Hockey. He is still seen on TV with the State High School Tournament where he has been the commentator voice of the tournament since he first appeared in 1964. Lou Nanne's distinguished hockey career, both as an amateur and professional, has led to inductions in both the U.S. Hockey Hall of Fame and the International Ice Hockey Federation Hall of Fame.